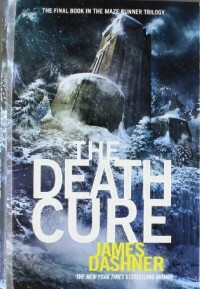 The Death Cure... the end to a series that I really enjoyed. And I did enjoy this book, although I am still not sure how I feel about the conclusion!! I have mixed feelings, but I have to wonder if perhaps that is exactly how the author meant us to feel. These books are surrounded with mystery, the kind of mystery that makes you question the powers that be and their authority and control over your life. That's the bigger message. So the series was written in such a way to constantly foster that mystery and I think that too many neat answers might have eliminated that feeling and lessened them overall messages and themes. Part of the mystery is rooted in the fact that no one, including the reader, ever seems to know exactly who they can and can't trust. There are moments that it is even hard to tell what is real and what isn't. These things keep the story interesting, and keep the reader from being able to guess what is going to happen next. The presence of WICKED throughout the series is the source of all mystery. The methods that they use and the things that they do in the name of the greater good are often incomprehensible and horrendous. Their involvement was so mysterious and so convoluted that it just amped up the misdirection and made the answers impossible to guess, which I loved. The ending was satisfying, but I think I expected something different, something more epically conclusive. By the end, the characters, and the reader, are exhausted and full of conflicting emotions. Their stories have been confusing and twisted and the ending leaves them with a sense of hope. And that is something that they have not had for a very long time. I am sad to see this series end, although I am happy that The Kill Order begins a prequel trilogy. I loved the premise of this story and found it engrossing and unique.